Graco Stadium Duo Pushchair is the ultimate tandem pushchair. With back seat suitability from newborn until 3 years, and the front from 6 months until 3 years, you're totally equipped for those busy city paths. 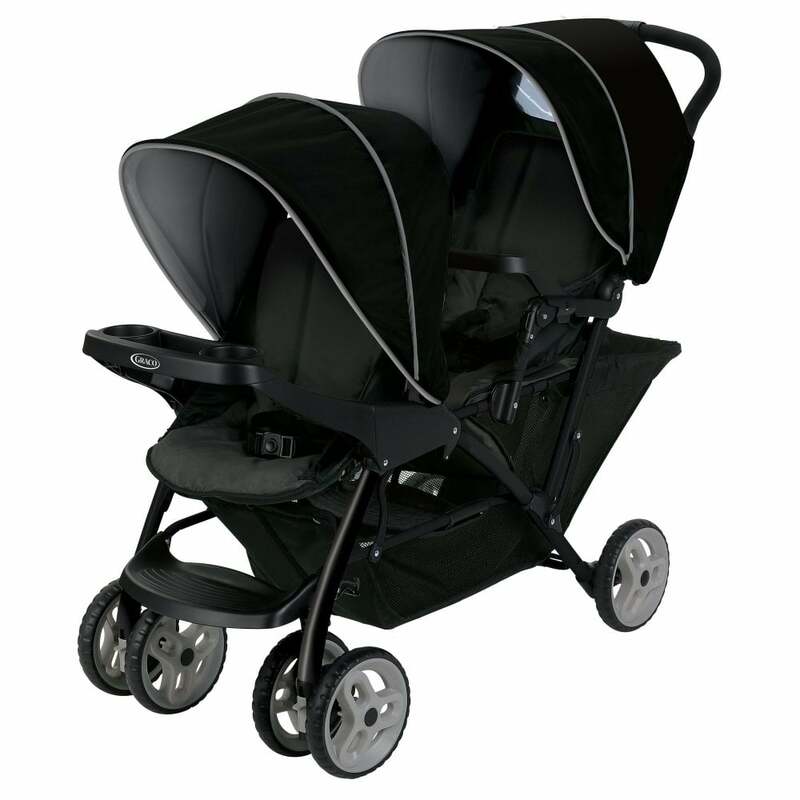 Why should I choose the Graco Stadium Duo Pushchair - Black / Grey? Brace yourselves for the Graco Stadium Duo Pushchair. This isn't just a double pushchair- it's a tandem double pushchair. Quickly and efficiently sit one child in front of the other and nip around busy city paths in this ultra manoeuvrable pushchair. This practical tandem pushchair features a one-handed fold which can be carried out in just one quick and easy movement. This can be completed in seconds, meaning you won't need to fiddle around with complicated folds! The auto-lock of this tandem pushchair really helps with your ease of use, too. This double pushchair offers ultra comfortable sitting and lying positions for both of your little monsters. With 3 recline positions in the back seat and 2 in the front seat, both of your children will be comfortable! This tandem pushchair is also compatible with selected Graco Car Seats, turning your pushchair into a pushchair travel system! Each seat includes a 5-point safety harness to keep those little wrigglers strapped in. Additionally, the quality sturdy frame provides complete safety and comfort for your child. Included in both seats is a play tray. You can use this to store bottles, food, or to hold those escaping dummies! This tandem pushchair provides all of the space that your little ones need whilst travelling around which ensures that your munchkins won't be kicking each other. In addition to this, the Stadium Duo has been designed with a see through back rest in the front seat. This offers a brilliant level of viewing for your back seat passenger! Do your children require a huge amount of supplies? Fear not, the Stadium Duo Pushchair by Graco includes a huge storage basket underneath with side accessibility. Store every supply you could possibly need on a day out in the city! Suitable from newborn (back seat only) to 3 years (or 15kg). Graco offer a 1 year Manufacturers Warranty from the initial date of purchase. Applies to UK mainland only.